The Gosford City Women’s Bowling Club presented a cheque to the Gosford Hospital Cancer Clinic for $1,500 recently. Funds raised were attributed to the Club’s charity day held earlier in September. 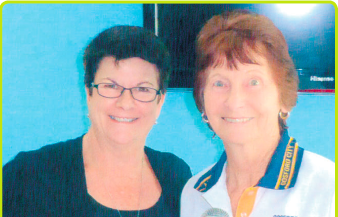 Club member, Ms Blanche Woodbury, said raising money for the hospital was one of the Club’s passions and that collectively, the club has raised over $11,000 in charity donations. “It was a great day for us bowlers,” Ms Woodbury said. “We had a Tombola cake raffl e and stalls and a ‘spider’ was run. “We played turn-a-round triples and we invited the men’s Club over as well,” Ms Woodbury said.